Plans to a root cellar from Summer 1976, No. 68, North Dakota State University Extension Service. The ability to both produce and store food is a central component to the sustainability of any society. I got to thinking about this while reading a Grand Forks Herald article earlier this morning on root cellars, and this in turn got me thinking about depressions archaeologists come across during pedestrian surveys. At first, a depression in the landscape simply looks like that: a depression. But this is why it is important to look to the written and oral history of a place, lest a former root cellar or a cache pit continue to go unnoticed. Before the Second World War, and prior to the post-WWII shift of artificially conditioning the air to our homes and refrigeration devices within the homes (this is all connected with the cultural inertia that today has us searching and exploiting the world for petroleum), our grandparents and great grandparents kept food and drink cool with root cellars and cache pits. Using a subsurface pit (or a cave, which is how Europeans refined and perfected the wine and beer processes) for storage takes just a bit of planning, thought, and foresight. It can be done, though. Some call them root cellars while others call them cache pits (those bell-shaped subterranean pits used by Mandan and Hidatsa cultures). 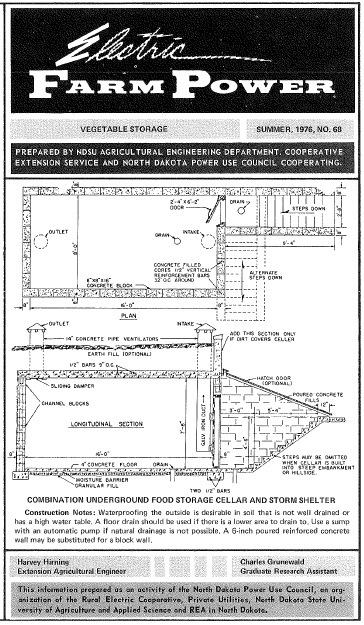 After reading the Herald piece this morning, I shot an e-mail to a North Dakota State University extension agent to see if I could get a digitized copy of a 1976 plan for a root cellar. Within the hour the extension agent responded with “Electric Farm Power: Vegetable Storage” (Summer, 1976, No. 68), this prepared by the NDSU Agricultural Engineering Department, Cooperative Extension Service, and North Dakota Power Use Council Cooperating (yes, note the keyword “cooperative,” as cooperatives and cooperation are central to getting things done). The illustration here is the design of a root cellar, and these also dub for tornado shelters in the summer. This is something to increasingly think about considering how Oklahoma has taken on serious tornados already this year, and also how a tornado came close to hitting the Denver International Airport not but a week ago. Anyhow, here above and to the left are the unadulterated plans to a root cellar. This entry was posted on Monday, June 24th, 2013 at 11:35 am	and tagged with Archaeology, Archaeology of Food, North Dakota State University, Punk Archaeology and posted in Uncategorized. You can follow any responses to this entry through the RSS 2.0 feed.